September 18, 2012 — — Greater Toronto Area (GTA) REALTORS® reported 2,544 transactions through the TorontoMLS system in the first 14 days of September. This result was down by 15 per cent compared to the 2,995 sales reported during the same period in 2011. The average selling price for sales during the first two weeks of September was $496,786 – representing an annual rate of increase of more the 9.5 per cent. Average selling prices were up for both low-rise and high-rise home types, including condominium apartments sold in the ‘416’ area code. 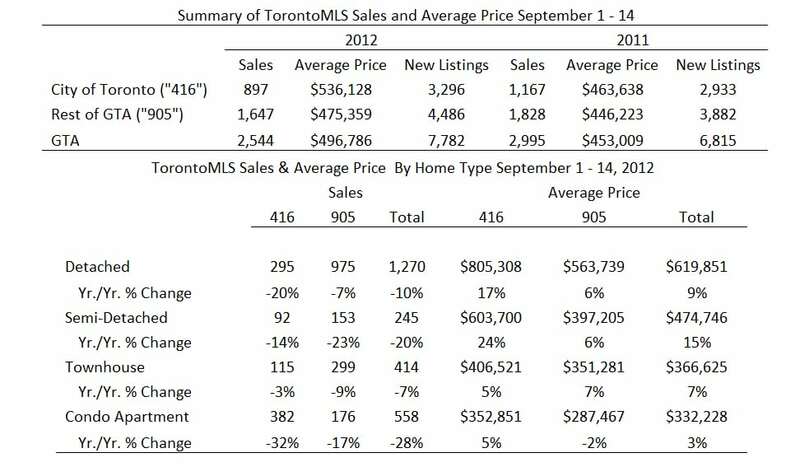 “Price growth continued to be strongest for low-rise home types during the first two weeks of September. This segment of the market has been very tight, with months of inventory remaining low from a historic perspective,” said Jason Mercer, TREB’s Senior Manager of Market Analysis.